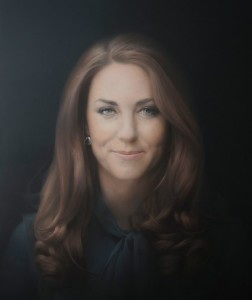 I had the privilege of meeting Paul Emsley and chatting with him about producing this historic Royal portrait. He is a quietly spoken, gentle man and he was completely unprepared for the considerable controversy that was provoked by the painting. Some of his most vitriolic critics had not even seen the original painting! The portrait itself is much larger than I was expecting and has a mesmeric and captivating aura. It is the only portrait of Catherine before becoming a mother, and will certainly earn its place in history.